Hank Williams doesn't seem to have been that great of a guy. He became addicted to the drink, morphine and other painkillers as well as fathering several children, only one of which he ever married their mother and this all before his untimely death at the age of twenty-nine. While Williams may not have necessarily been the best guy (and possibly one of the worst parents) it is usually these types of people that stand to create the most interesting stories and in Williams case, write the most interesting ones as well. Before becoming popular as a singer Williams was primarily known for being one of country and westerns top songwriters. Williams penned and performed countless tunes for a radio show in his hometown of Montgomery, Alabama before securing a deal with the music publishing firm Acuff-Rose as a professional songwriter. All of that taken into consideration, you wouldn't really come to learn much of it from the Marc Abraham (Flash of Genius) biopic concerning Williams as it tends to only patch together a few story points in the singers life rather than dig in and find out what really made him tick. It's admirable that Abraham doesn't take the easy route of opening his film backstage before one of Williams last shows and using it as a framing device for a period of reflection in which the movie's told, but he also doesn't come up with an alternative way to tell us anything insightful about the man and a movie needs to offer more than a Wikipedia page does. 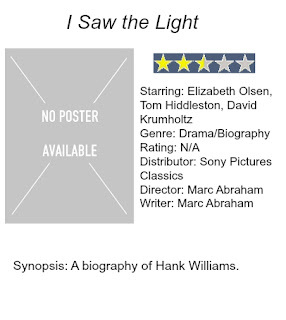 Based on the book Hank Williams: The Biography by Colin Escott, George Merritt, and William (Bill) MacEwen, I Saw The Light begins in 1944 when Tom Hiddleston's (Thor, The Avengers) Williams marries Audrey Sheppard (Elzabeth Olsen) in a Texaco Station in Andalusia, Alabama, with a justice of the peace. The film never touches on exactly when or how these two met or even provides any reasoning as to why they actually love one another, but instead assumes the audience trusts that they do despite the whole of their relationship being soaked in turmoil. If it's not the bickering back and forth between Audrey and Williams mother, Lillie (Cherry Jones), concerning who gets first dibs on the money in Hank's pocket it's Audrey wanting to be a singer herself without owning up to the fact she doesn't have the talent to do so. She insists her husband let her sing on his radio show or at gigs on the road, but while Williams is more than aware of his wife's vocal shortcomings he can't bring himself to tell her no. It should also be noted that Williams is twenty-three at the beginning of the film and while Hiddleston is a good looking, well-groomed guy he never pulls off looking this young. It is almost immediately that the fighting begins between Hank and Audrey while Hank is still attempting to get out of Montgomery and on to the Opry stage. Getting to the Opry is the sole objective for the first hour or so thus allowing for the film to focus on the aspect that one would assume would make the film stand apart from something like Walk the Line in that the core relationship here is more of a competitive one where both parties are more interested in themselves and their own successes than the each other. It would no doubt have been an interesting angle to explore more, but again, Abraham simply skims the surface never allowing any of the scenes to breathe. After hitting on the ups and downs we're in for concerning Hank and Audrey the film skips forward to 1947 when Williams records, "Move It On Over," for Acuff-Rose and it becomes a hit. The family moves to Nashville and begins to get comfortable with their new roles in "Music City," but Hank's drinking gets in the way and Audrey leaves him for what feels like the first of a hundred times in the movie. We get the obligatory rehab scene where Hiddleston shakes and sweats in a straight jacket before running back to Audrey for her forgiveness. We then get the moment where Williams begs Fred Rose (Bradley Whitford) to let him record his version of "Lovesick Blues," that Rose doubts, but allows anyway only to see it become Williams ticket to the Opry stage. It is this episodic nature of the film that makes it feel like little more than one moment after another strung together in order to inform us of Hank Williams life and times, but never does the film settle into a groove that feels natural to the people it is describing. The whole thing is rather stilted as we can see the recreation happening instead of becoming so involved with the characters and their plights that we forget we're watching actors on a screen. One character in the film describes Williams music as being able to, "expose the darkness inside us all through song so that no one has to take the baggage home with them," and while this may be true (the pioneering facet of country music is how it relates to it's target audience) this film about one of country music's actual pioneers never mines it's subjects own soul to expose his many darknesses. I Saw The Light tells us that Williams published songs under a pseudonym in order to get the less commercial stuff off his chest, it displays a deep bond between Williams and his steel guitarist Don Helms (Wes Langlois), it even has a doctor explain to Williams and his second wife, Billie Jean (Maddie Hasson), that Williams has spina bifida that has been the cause of Williams back pain his entire life, but with none of these things do we ever get any real context. We never hear any of "Luke the Drifter's" music, we never see Hank and Don have anything more than short conversations that display their shorthand and we can only guess Williams returned to the drink and popping pills as a way to numb the pain from his spinal defect. More than any of this, we never see Williams writing a song much less any insight into what inspired him to write as much as he apparently did or how he came to love music in the first place. The usual critique of the performances being good, but the movie failing to live up to them can easily be applied here, but not even Hiddleston's efforts and Olsen's attempts at crafting a complex female character could save this. While Hiddleston has Williams signature singing style down, his southern accent is a bit off on certain words. And while the story does Hiddleston's performance few favors in allowing him to ever really dig into the psyche of Williams the actor is able to get across the singers inability to ever control his impulses and in one of the few exceptional scenes Hiddleston squares off against David Krumholtz as a reporter making an argument for the sincerity of folk music in one of the few instances it feels we catch a glimpse of what the real Williams might have been like. While this aforementioned scene is the one time in the film we cut to the core of the main character there are others, such as when Rose and Williams go to MGM headquarters to visit Dore Schary (Josh Pais), that are only present to solidify the mythology of how Williams is thought of today-as this mysterious, but stern godfather of country music that didn't care if you liked him or not. All of that said, the film plays it so straight that it's not unsurprising it goes the way it does and thus we don't really feel anything when the inevitable conclusion comes around and the credits begin to roll. The film looks gorgeous as it is handsomely mounted to capture the warmness and welcoming nature of the south and the period details are more than superior as are the handful of performance scenes we get. Hiddleston does favor the late Williams in facial structure and he pulls off his outlandish suits well. If one is looking for an unsurprising, completely traditional music biopic this wouldn't be a bad way to go as it delivers exactly what one would expect, but the absence of any real heart or soul is apparent and made this a rather stinging disappointment for me considering I typically fall head over heels for movies about the process of creating music. If I Saw The Light is to be taken at face value it seems Williams never really had an opportunity to enjoy his success and was more a professional at making a mess of things than a singer. Hopefully this isn't the absolute truth and maybe one day we might get a Williams biopic that does the country legend justice, it's just a real shame this couldn't be the one to do that because it certainly had all the right parts in place.